Bilbao, a port city in northern Spain, is the perfect place for a getaway for anyone that has a love for architecture, urban culture and delicious cuisine. It’s a hive of artists that have been drawn in by its quirky buildings and riverfront landscapes, but it still has a traditional culture at its heart. 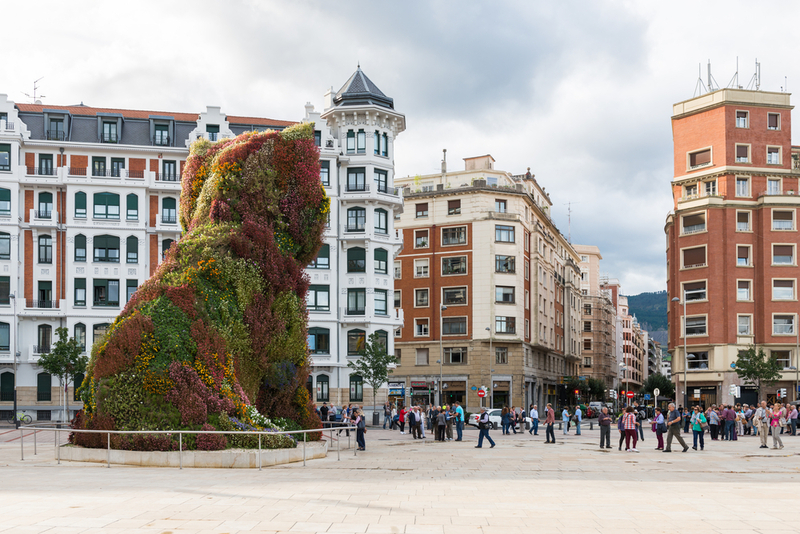 Here are ten things to see and do in Bilbao to ensure your trip is unforgettable. The Guggenheim Museum The glittering titanium Museo Guggenheim Bilbao is often referred to as a masterpiece of modern architecture. It’s construction triggered further gentrification of the city and put it in the spotlight. The Hotel Carlton is currently running a special offer that includes one night in a double room, a buffet breakfast and admission to the Guggenheim museum. Bilbao Fine Arts Museum Located inside the city’s Doña Casilda Iturrizar park, the Bilbao Fine Arts Museum is home to more than seven thousand works, ranging in time from the 12th century to the present day. Catedral de SantiagoCompleted in the early 16th century, the must sees in the Cathedral of St James are the small Gothic cloister, the Door of the Angel and its tower. Casco Viejo (Old Town) Casco Viejo is full of old world charm, quaint streets, enchanting architecture and friendly locals. The elegant Teatro Arriaga Neo-Baroque theatre is one of the town’s best features. Parque de los PatosAlso known as Duck’s Par, this beautiful green space is Bilbao’s main public park. There are an array of ancient trees and stunning flowers in the English-style garden for you to admire. Basilica de BegoñaSitting above Casco Viejo, the Basilica de Begoña is an important pilgrimage church that was built in the 16th century. You can marvel at the beautiful architecture and the stunning views of the old town. Mercado de la RiberaBilbao’s marketplace, which was built in 1929, offers tourists a glimpse into the everyday life of the city. The building itself is beautiful, featuring Art Deco designs, lattice windows and floral decorations. Funicular Artxanda and Mount Artxanda One of the best ways to see all the beautiful scenery in Bilbao is to ride the Funicular Artxanda cableway, which takes you to the very top of Mount Artxanda. Once you depart your car, you will be treated to spectacular panoramic views of the city. Gorliz Beach Famous for its stunning natural surroundings, Gorliz Beach is a tranquil haven just outside of the bustling city. You can try your hand at watersports or simply lie back and relax.Torres Isozaki Towers This skyscraper extends to 83 metres above Bilbao’s skyline and was the product of architectural visionary Arata Isozaki.